We offer a credit of move in truck rental fees of up to $40 for new tenants. 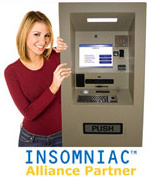 Self Service Kiosk available on-site for rentals and payments 24/7! We will be glad to discuss any lower prices or special offers you may have received from another facility for comparable features and services. Camp Horne Self Storage is an owner operated self storage facility that is conveniently located in Emsworth, Pennsylvania, approximately 7 miles North of downtown Pittsburgh. Our facility is the newest in the Emsworth area and offers solutions for both residential and commercial storage needs. Our goal is to provide you with a clean, safe, secure, state-of-the-art facility in which to store your possessions, all at a reasonable price. Your satisfaction is our highest priority and we look forward to making a positive difference in your storage experience. © 2018 Camp Horne Self Storage All rights reserved.